Netherlands based shipbuilder Damen said it has delivered two of four ASD 3212 tugs to towage and related marine services’ company Smit Lamnalco. Arriving in Oman on July 10, the two new tugs, each with a bollard pull of 80 metric tons, will be directly deployed at a Oman India Fertilizer Company S.A.O.C (OMIFCO) dedicated terminal in the Port of Sur and will be owned and operated by the joint venture Bahwan Lamnalco Company (BLC). 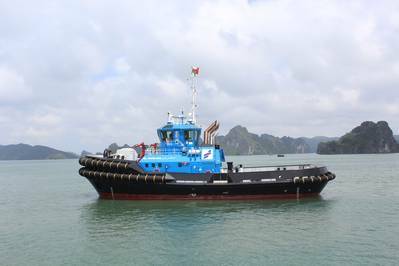 In November 2017, Smit Lamnalco announced that it had decided to order four Damen ASD 3212 tugs following an award of two major contracts, in Oman and Australia. Built in Damen Song Cam Shipyard in Vietnam, the two new arrivals, SL Murjan and SL Lulu, were customized to Smit Lamnalco’s requirements. This included a modified aft deck and the addition of an aft winch to the SL Lulu. The next two Damen ASD 3212 tugs will head for the mining town of Weipa in Queensland, Australia in the fourth quarter of 2018, where they will be deployed on a Rio Tinto project.